Rachel Farmer has roots in the mountain west, going back to the mid 1800’s. Currently based in New York City and originally from Provo, Utah, for the past nine years Farmer has been working on a series that draws inspiration from a variety of sources: her Mormon pioneer ancestry, childhood play with ceramic figurines, her grandmother’s quilts, historical dioramas, and mythologies of the American West. Her work dissects and re-imagines the stories that populated her childhood – various skewed histories that got passed down through family, church, and popular culture. Farmer’s miniature sculptures depict pioneer women in action. Hand-built from ceramic stoneware, they are delicate and sturdy, ghostly and spirited. They are arranged by the artist into implied narrative scenes, in a desire to visualize and play with tales of her foremothers while also acknowledging the missing details of their personal stories. Looking Forward, Looking Back is a new installation created specifically for the historic C.C.A. Christensen log cabin. 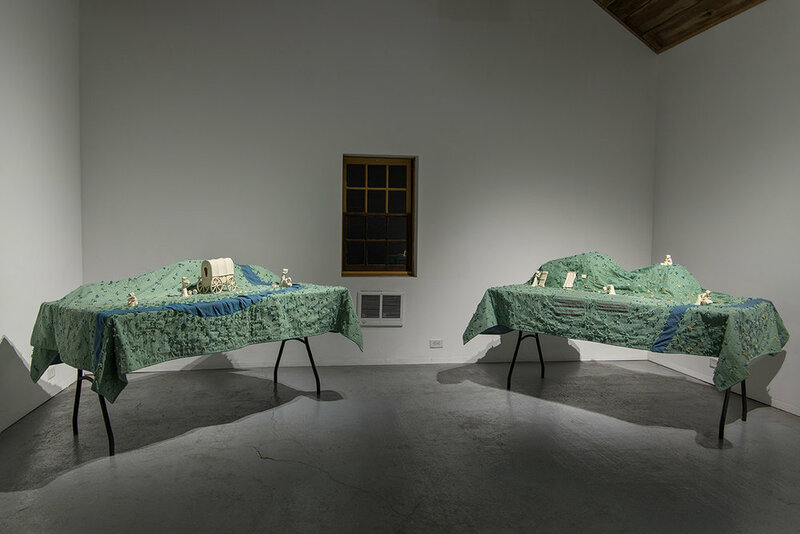 The work features twelve new figures, housed within three quilted landscapes.